In my kid’s bathroom lighting post I highlighted a floating LED light that creates an underwater light show that will delight kids when they are having their bath. Now I’ve just came across a unique DIY option – using glow sticks! 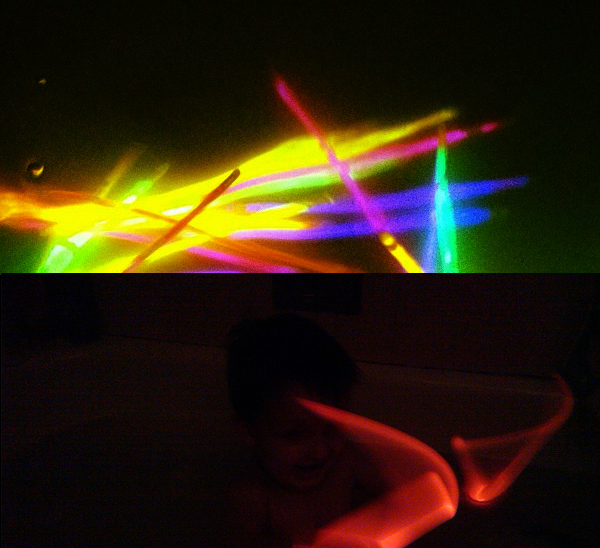 Turn the lights off in the bathroom and use a few glow sticks to colorfully light up the bathtub. You can even put glow sticks inside of balloons, blow them up and have floating lights. In one of our recent post we highlighted battery powered LED lights that you can have floating around or attached to the walls to create a more spa like experience in the bathroom (spa lights). Well here is a little novelty gadget for a kid’s bathroom – a floating light that projects light over the underwater. 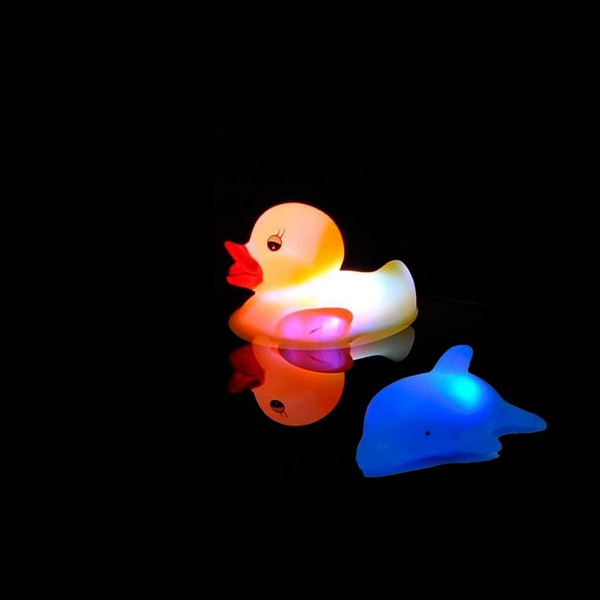 The duck and dolphin combo are water activated, and the lights change color. Available here on Amazon for $4.57. 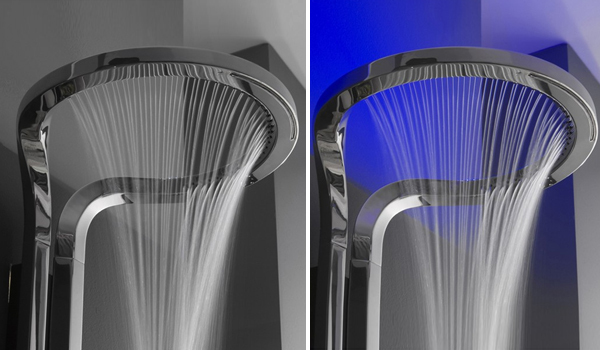 In a previous post we highlighted the AMETIS Shower Column by Graff (luxury showers). Another piece in the collection is a hollowed brass bar, merged with LED lights, to produce a luxury faucet. Once again, Swiss designer Davide Oppizzi takes the fluid form of water as inspiration in crafting this piece. Just like the Shower Column, light is unified into the bathroom faucet to become an interior design element. Here the light changes from blue to red based on the water’s temperature. The glow of the light also showcases the sculptural curves of the brass bar – Graff Faucets. Merging high tech with high end design, the new AMETIS collection by Graff brings elegance and luxury to the bathroom. 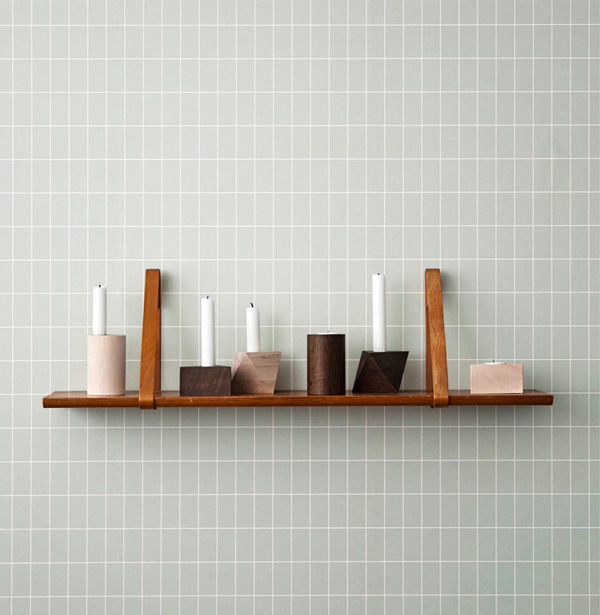 One of the pieces in the AMETIS collection is the Shower Column. A beautifully crafted, hollowed brass sculpture blended together with LED bathroom lighting – designed by Davide Oppizzi. 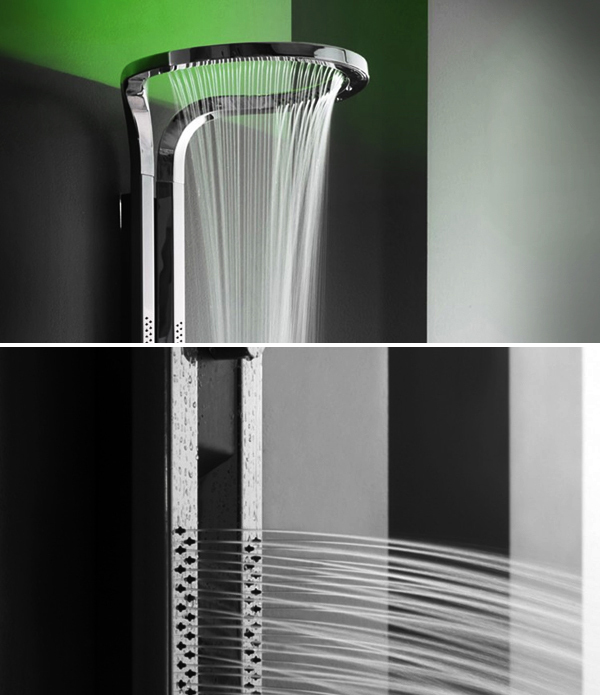 The fluid design of the shower column is inspired by the free flowing of water itself. Even how the water comes out has an artistic touch to it. Like all pieces in this collection, lighting is designed to be uniformed with the shower column making it an interior design element. 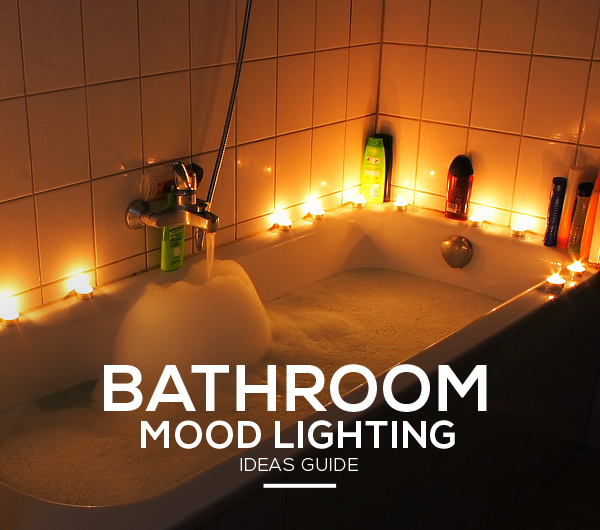 You can have the luxury bathroom lighting set to match your mood (choose to bathe in red, blue, white or green light) or they can be set for functional purposes (changes from blue to red depending on the water’s temperature). 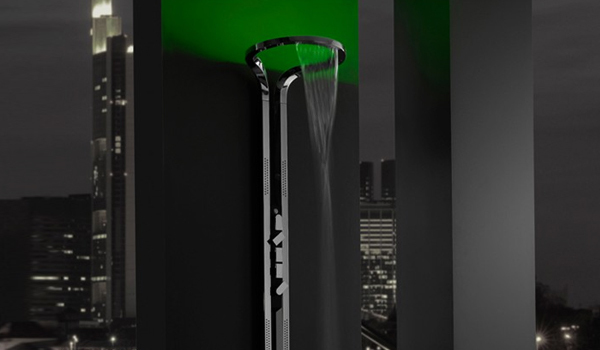 This ultra-modern shower column comes in black, white, and chrome powder coated finishes – Graff Faucets. 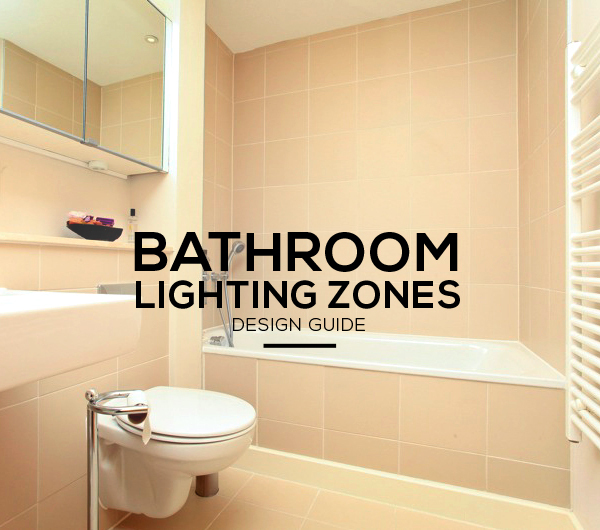 When it comes to UK bathroom lighting, you will have to know the different zones that make up a bathroom layout. Bathroom lighting zones are based on how close they are to water and how likely any light fixtures in the zone will get wet. By knowing the different zones, you can then choose the right light fixtures for safe lighting. Bathroom light fixtures will have an IP rating, which rates how well the electrical components are protected. The zones and ratings are set by the IEE Wiring Regulations, a UK national standard in which all wiring must adhere to. So if you are looking to install a range of bathroom lighting ideas within in the UK, these zones and ratings are important for safe wiring. Each bathroom light fixture will have an IP rating. There are two numbers in an IP rating, the first is the protection the light has against dirt, insects, and other foreign things. The second number is the one that applies to bathroom lighting, this is the amount of protection the light has against liquid and moisture. The second number will range from 0-8, with 8 being the most protected from moisture and water. 7 = the light fixture can be submerged in water up to 1 meter in depth. Lighting zones in a bathroom is determined by the distance from a water source. 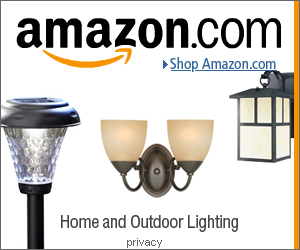 In order for safe bathroom lighting, light fixtures with the right IP rating need to be used within specific zones. Zone 0: There are a number of ways to add decorative lighting within water fixtures. For example taps and shower heads can have LED lights fitted inside of them. Zone 0 refers to areas that will be submerged in or have direct exposure to water: inside bath tubs, the shower base, or inside a basin are other examples. Lights in zone 0 must have an IP rating of IP67, and must be low voltage (12v or less). Zone 1: This zone is usually made up of areas above (up to 2.25m) a bath tub and a shower base. Lights for this area should be rated IP44, or if the lights will be in direct contact with water, such as inside a shower space, the lights need to be rated IP65. Zone 2: This is where any water might be splashed. So right next to zones 0 and 1, measuring 0.6m horizontally and up to 2.25m vertically. This zone also applies to wash basins, ranging 0.6m in diameter around the water source (the tap). Light fixtures in zone 2 need to be rated IP44 or better. Not Zoned (Use to be Zone 3): This is any area beyond zone 2 (white area in the diagram). There are no requirements when it comes to lighting past zones 0,1, and 2. It would be wise though to use lights that are rated IP44.